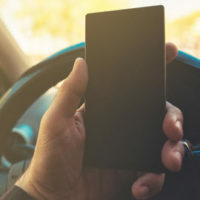 Even using a cell phone with a “hands-free” device, which is legal even in places like Tennessee that prohibit texting while driving, can still lead to a serious car accident. Slate cited additional studies that showed “ contrary to popular belief, hands-free phone conversations result in the same drop in driving performance as hand-held phone usage.” Indeed, a person operating a cell phone in any way while driving can show the same “level of impairment” as a drunk driver. Tennessee law continues to play catch up with this increasing level of technological distraction on the state’s roadways. On January 1, 2018, a new state law took effect that targets one subset of distracted driving behavior–operating cellphones while driving in and around schools. Last May the Tennessee General Assembly passed Senate Bill 954, which Gov. Bill Haslam signed into law and is now partially codified as Section 55-8-201 of the Tennessee Code Annotated. This new section makes it a Class C misdemeanor to “knowingly operate a motor vehicle in any marked school zone in this state…and talk on a hand-held mobile telephone while the vehicle is in motion.” A driver who is 18 or older can still use a hands-free device. But underage drivers cannot use a cellphone at all while driving. The law exempts persons who need to call the police or emergency services providers. As a Class C misdemeanor, violating the new law will only result in a $50 fine. The General Assembly’s Fiscal Review Committee estimates the state will collect upwards of $30,000 in fines annually by the 2021 fiscal year. The Committee expects about 100 violations during the remainder of the current fiscal year. Did Distracted Driving Cause Your Tennessee Car Accident? Proof of distracted driving is often critical in personal injury claims arising from accidents. If you can prove that a driver was distracted by texting or using their phone, that can be enough to establish negligence. Also keep in mind, violating any Tennessee traffic laws, including the newly enforced ban on using cell phones in a school zone, is considered per se negligence. Of course, proving distracted driving is not always so simple. This is why you should always attempt to identify witnesses at the scene of the accident and obtain a police report. If your personal injury case proceeds to litigation, you may also be able to subpoena the driver’s cell phone records to establish they were using their device just before the accident. You should always worked with an experienced Tennessee personal injury lawyer when dealing with the legal aftermath of a distracted driving accident. Contact the offices of Fox & Farley, Attorneys at Law, in Knoxville, Clinton, Gatlinburg, Pigeon Forge, or Sevierville today if you need immediate legal assistance.